On Saturday night, DH invited a few folks over for dinner and a movie TV show: the world premiere of the 48 Hours Mystery show about Colton Harris Moore, 19, aka the Barefoot Bandit, that he (and another of our guests, Sarah Prior) had spent the last six months reporting and producing. Dinner (produced by me) was black bean chili, cornbread and salad. Dessert was a cheesecake because Colton, who began his life of crime by stealing food to stave off hunger, had once stolen a cheesecake and DH thought that would be a fitting dessert. 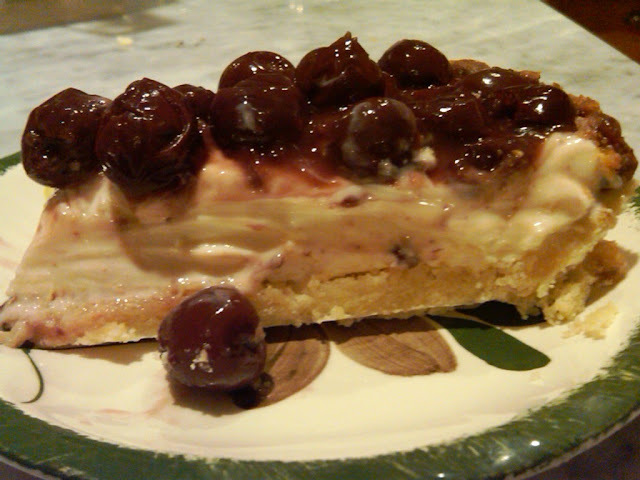 I was less enthusiastic, having recently made an excellent cheesecake. 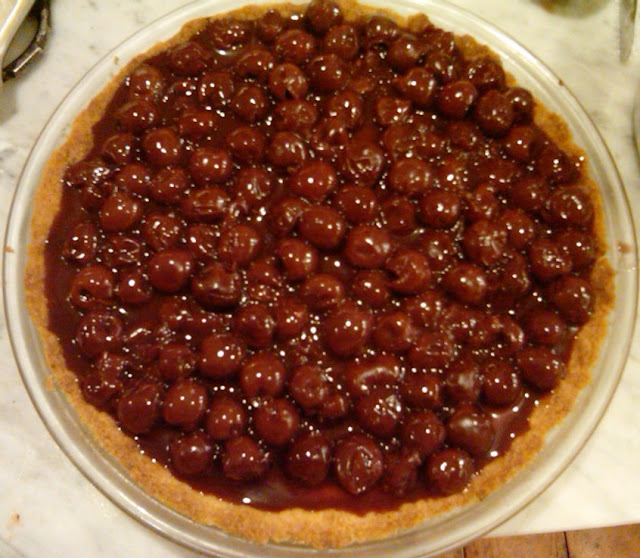 But then, I discovered this irresistible recipe for Cherry Cheese Pie (Colton had stolen a blueberry cheesecake, so I figured this was close enough). 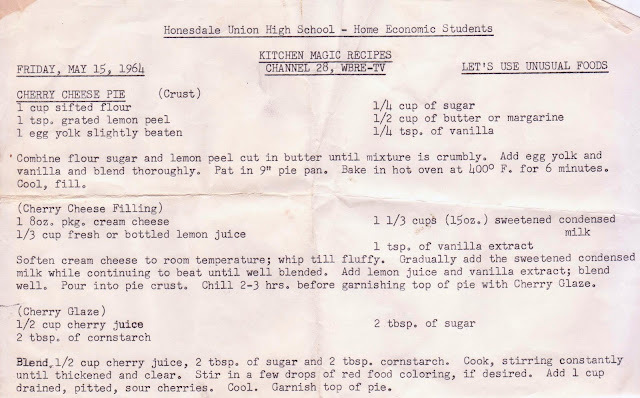 There's so much to love about this recipe: it's from a high school home economics class in 1964 (via a local TV station) and the shout out of LET'S USE UNUSUAL FOODS is quite a call to action. So I made it. 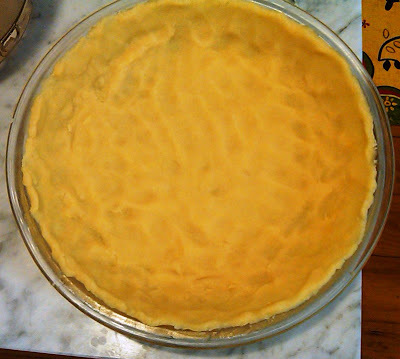 The crust is very odd; it's first mixed like a traditional pie crust but then an egg and vanilla are added and the whole thing is pressed into the pie pan and blind baked (the baker's term for pre-baked without a filling). The filling is super easy. Just mix cream cheese, sweetened condensed milk and lemon juice, pour it into the cooled crust and let it set in the refrigerator for a few hours. No baking! When this recipe was written, cans of sweetened condensed milk were 15 ounces; today, they are 14 ounces, but it won't affect the recipe. The cherry topping is the star of this dessert. It is a homemade -- and luscious -- version of all those commercial canned "Mighty Fine" pie fillings, the gloppy fillings that ruined many a fine pie. But made from sour cherries (available in jars at specialty stores), cornstarch, sugar and cherry juice, the consistency is lovely and the flavor a perfect combination of sweet and tart. What a find! Cutting the pie was a bit of a challenge; the crust was very hard (perhaps I over-baked it) and getting clean slices was difficult. Still, no one complained, and we all thought that this dessert was the perfect entree to the excellent documentary that followed. I know you'll want to learn more about Colton and his fascinating story and witness Sarah's bravery when Colton's mother threatened to get her shotgun if she came any closer! Click here for all that. But did he use fresh (dried) heirloom beans? They were canned, what a shunda!! Now I know what's next: The soaking of the beans in Ann Arbor. I'll be sure to try this next weekend. Thank you very much.